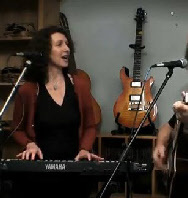 SOUNDESTINY is Neo-celtic Rock (folk rock with a medieval twist). Their songs are adventure, drama, romance and passion interwoven with driving melodic music. They transport you to another time and place, into the heart of a gripping quest. Their strongly theme-oriented albums are dark, dangerous, and exciting journeys into the unknown. Their music features songs inspired by the Lord of the Rings and the Hobbit, medieval adventure romance, and (future projects) on Arthurian legend. Julia Lefik (vocals & narration); Clyde Schipke (guitar); Mick Bohl (guitar); Max Mathers (bass & vocals); Craig Claxton (guitar), Paul Lines (vocals); Bill Turgeon (drums); Sarah Hawgood (narration); Alyssa Marie [Ally] (vocals & narration); Jo Davie (vocals); Andrew Stark (bagpipes); Matt Herne (banjo). Darryl studied piano formally from an early age and successfully completed examinations in classical music at the Queensland Conservatorium of Music. However, his musical interests later gravitated to contemporary styles. He learned to play guitar and flute, and incorporated many Rock, Folk, and Pop songs into his repertoire. Songwriting has always been his major musical passion and he strives to incorporate heartfelt lyrics with catchy melodies in a style often referred to as Folk Rock. His prized musical instruments include a custom-made cherry sunburst Maton acoustic guitar, a hand-crafted flame maple Mirage archtop electric guitar, an 80 year old fully restored rosewood Beale piano, and his Armstrong silver flute. Having performed extensively as a solo artist, he has been a vocalist and guitarist / keyboardist in various bands and duos including Crossroads, Mr Mustard, Crimson Heart and SOUNDESTINY. He has written songs that have been recorded and played on radio stations and television programs and distributes his music internationally. Darryl has written songs for four SOUNDESTINY albums, three of which were inspired by his passion for ‘The Lord of the Rings’ and ‘The Hobbit’ novels, and a fourth album that focused on love songs. Another album is planned for the near future - dealing with the legend of King Arthur due to his interest in the Dark Ages of early medieval times. Apart from his musical pursuits, he is a biologist with a Masters degree in Environmental Science. His thesis analysed the problems associated with captive breeding and reintroduction of native Australian animals to the wild. However, in general, his biological interests have focused primarily on molluscs (shelled invertebrates) and he has authored and co-authored various articles and popular publications on these animals. Darryl also holds a 4th degree black belt and has trained extensively in kickboxing and integrated martial art styles since 1974, as well as having been both a competitor and judge in state and national tournaments. He has a beautiful wife, Maria (who is a marine biologist) and two lovely daughters, and they live in Brisbane, Australia. Elissa has always had a passion for music and singing. From an early age she learned piano, performed in nearly every school musical as she went thorough high school and spent many years training to become a contemporary dancer. After completing an Arts Degree in languages, Elissa travelled extensively around the world spending most of her time in South-west Asia and the Middle East. After this ‘growing up’ experience, she returned to embark on Naturopathic Medicine studies and subsequently went on to have a career as an alternative health practitioner. Music beckoned and Elissa joined a choir while living in inner west Sydney. This rekindled her passion for music and singing which had been put aside while raising a family and working in alternative medicine. After moving to Brisbane, she joined another choir which led to performance opportunities both as a solo performer and in group performance. This just wasn’t enough and eventually she joined a band - Herding Cats - which specialised in contemporary rock music, as a back up and lead singer. Performances included community gigs and events and the odd paid one too. Discovered by Darryl Potter, she is now a member of SOUNDESTINY and loves getting the chance to get into the recording studio and beat out those pure melodies and gorgeous harmonies. As well as music pursuits, she also ran a successful Latin Dance business in Brisbane for a few years. Apart from SOUNDESTINY, Elissa sings at present with a band named Honeymoon Fresh., when not looking after her two beautiful girls, and going out with her new boyfriend. Kim began his musical career at an early age, singing in a Presbyterian Church youth choir that was led by his mother. At age 10 he played the lead role in the pantomime ‘Blue Beard’ produced by his mother, and tasted the addictive drug of focused applause. With a father who played numerous lead tenor roles in the Queensland Light Opera Company, and studied singing & performance at the Queensland Conservatorium of Music, it was inevitable that Kim would have an interest in music. At 15, he decided to learn drums to become one of the Toowong High School Rock band musicians who would back the performers in the school productions of ‘Godspell’ and ‘Jesus Christ Superstar’. His drums instructor, Col Gillies, was told to teach him all he knew in 3 weeks! Kim was taught by Col for about 5 years after which time he joined the Harry Lebler Drum School in Mary Street, Brisbane. Here he studied drums with Harry and his son Donald for another 5 years, during which time he shared a practice room with a 15 year-old named Mitch Farmer who later became one of Australia's premier session and live drummers. Over time, the school Rock band developed into a garage band - Nuteclam Rarkle, that played local halls and backed several interstate artists at Gold Coast venues from 1974 - 1976. 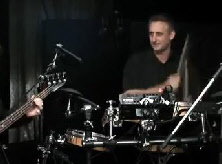 Two members of this band, Simon Moore and Andrew Black, later played alongside Kim in the Brisbane ‘bush band’ – The Verandah Band from 1982 - 1992. At their peak, the band averaged more than 4 gigs/week for 2 years at venues ranging from small school fetes to open-air concerts with an audience of thousands. For 10 years, The Verandah Band played the famous New Years Bush Dance at Brisbane City Hall - an event that raised funds for the Moreton Island Protection Committee. From 1976 - 1982, Kim played in The Union Blues Band, a ‘Chigago Blues’ band that recorded an album – ‘The Blues is My Only Friend’ at Sunshine Studios in 1979. The now legendary Brisbane band featured Al Hensley on keyboards/vocals, Dave Uther on guitar/vocals, Jeff Cribb on Bass, and Kim on drums. The Union Blues Band supported many international Blues artists who visited Brisbane including: Bo Didley, Rory Gallagher, Sonny Terry & Brownie McGee, George Thorogood, and Tom Waits as well as Australian bands - The Bushwackers, Matt Taylor and the The Broderick Smith Combo. In 1981, they were invited to a Sydney Blues festival where they played alongside the American bluesman ‘Hightide’ Harris and local Sydney bands including The Dynamic Hepnotics and The Humdinger Dogs. During this festival, The Union Blues Band played at the world famous jazz venue, ‘The Basement’, receiving a standing ovation and encore. To this day, that gig remains the highlight of Kim's live performing career, even rating above the numerous international acts that the band supported. After shelving his drums in the early nineties, he re-emerged in a north Brisbane band – Herding Cats, playing gigs alongside Elissa, before both joined SOUNDESTINY. In 2005, Kim established ‘RigiDigital Studios’ to allow him and his busy composer-friend Darryl Grant Potter to work together on SOUNDESTINY projects. Their first collaborative album, Journey Through Love, took nearly 2 years to complete, but served as the springboard for the next project – Winds of Change. Among other things, Kim is a Scanning Electron Microscopist with a PhD in Parasitology. He holds a black belt and has competed strongly with wins and places in a range of kickboxing-style events. Kim is married and has a son and daughter. SOUNDESTINY, its music and recordings, are a Trade Mark ™ of Darryl Grant Potter. Since 2003, SOUNDESTINY has also been registered with the Worldwide Band Name Registry www.bandname.com . As a business, it is state-registered (BN19312945) and nationally-registered (ABN88264548056).